Personalized snowman cookie ornament is baked of claydough but looks yummy enough to eat! Resin. 3" long x 3/8" wide x 5" high. Specify name; limit 1 line, 10 letters/spaces. Specify year; limit 4 characters. I love this cookie ornament! It looks like a real cookie. Yum! Great gift for my grandchildren and great grandson now. I give ornaments yearly and appreciate your selection and variety of items. The fact that so many can be personalized is great and will let them know what they got each year as they grow. First of all I ordered two driving wheels for my soon to be driver twins. You did not have those any longer, so I chose this replacement. They are sooo cute because they really look like cookies and not just some flat piece of dough! You also did not charge me for the shipping, because it was not my fault that you did not have them when they had been advertised. I must say I do hope that you have the driver's wheel soon though. The twins turn 16 in Februrary so I would order these with 2018 as soon as you have them again. Thanks for your great service!!! I give these ornaments as gifts to my grandchildren. I love giving ornaments every year to my grandchildren and now my great grandson. Hopefully they will bring them joy long after I'm gone and will remind them of me every time they decorate their trees and will pass them on to their children someday. I am pleased to have selected this item. New one each year. This year it took too long for delivery. Your out of stock notice on my first selection was very disappointing. The personalization of tree ornaments is a nice, creative, fun and economical wayat this time of year. buy this ornaments every year since my kids were little gives them something to remember every year. This ornament is a Christmas gift; it will be a welcome addition. A Sweet-Treat You Can't Eat! I ordered 7 different ornaments and loved them all, they were all perfect!!! I am always happy with MK products! 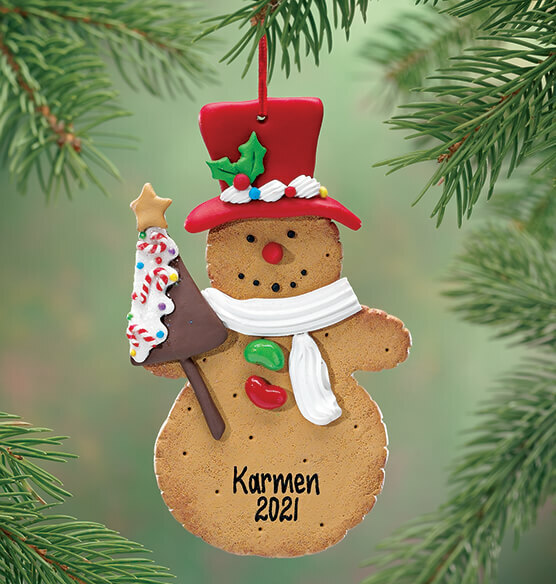 I ordered 20 0f these adorable cookie ornaments for my great grandchildren. Very well pleased!. I have ordered ornaments for seven years and have never been disappointed. They have been quality, well made and engraved correctly every time. A Sweet-Treat Not To Eat! I brought this cute, gingerbread cookie snowman with my name and this year on it. It is currently hanging above my "delicious-mouth watering gingerbread house". The ornament makes my gingerbread house all the more delectable! Use your "creative-state-of mind" to determine how you want to use this ornament! New ornaments each year are a family tradition. These are cute and budget friendly. will remember our time together. Each year on Thanksgiving Day, I give each great-grand child a personalized, dated ornament to put on their own tree at home. Seems like each year I get one first Christmas so I will be looking for these every year for a long time.